Aggregate Industries’ innovative and highly-durable coloured asphalt solution has added the finishing touches to a new visitor centre at Sherwood Forest National Nature Reserve in Nottinghamshire - an area famous for its role in the Robin Hood legend. Opened at the end of August, the stunning new £5m visitor complex in Edwinstowe will provide vital information on the area’s rich wildlife and woodland as well information on the Robin Hood legend to the 350,000 people who visit the popular nature reserve each year. The project, developed by an RSPB-led consortium, together with Nottinghamshire County Council, includes flagship facilities such as a shop, a café with an outside terrace, an amphitheatre as well as a play area for children. Given its status as one of country’s best-known landmarks, it was important for the design and build of the visitor centre to enhance the area’s natural surroundings as much as possible. 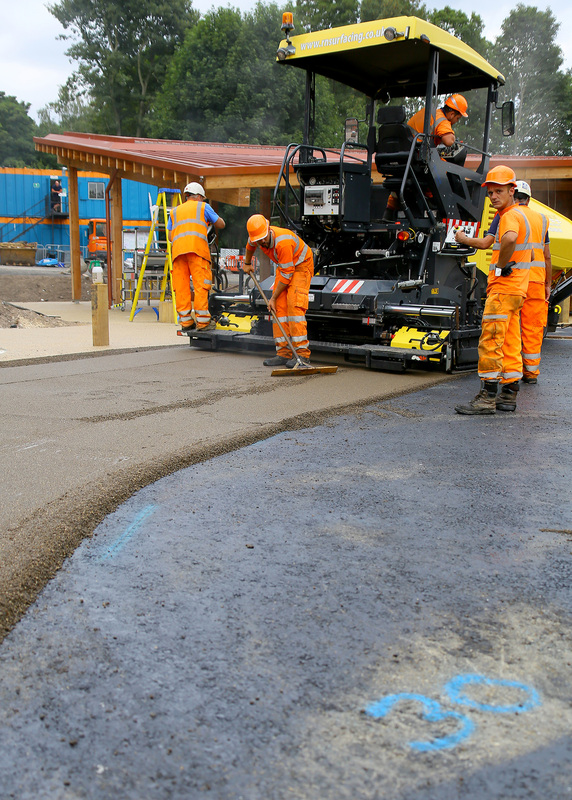 As such, one of the key requirements for contractors Woodhead Construction and R.N Surfacing when it came to surfacing the drop off point for visitor coaches, was sourcing asphalt to complement the resin bond golden gravel used on the rest of the site. Cue Aggregate Industries SuperColour Ultra, a range of distinctly coloured asphalts, which uses a translucent penetration grade, resinous hydrocarbon binder. The special binder is readily pigmented and provides a wide range of asphalt colours. Using its recently-opened SuperColour sampling lab at the company’s Express Asphalt plant in Doncaster, Aggregate Industries created two samples to R.N Surfacing in natural and buff. After testing out the samples to ensure they met the right specification and performance, the contractor eventually opted for the natural colour. Overall, Aggregate Industries supplied 60 tonnes of SuperColour Ultra in natural, which unsurprisingly achieved truly impressive results and led to one happy client. Aggregate Industries’ marketing-leading SuperColour asphalt range boasts a wide choice of coloured asphalt surfaces, including reds, greens and yellows, all designed to harmonise with site surroundings.